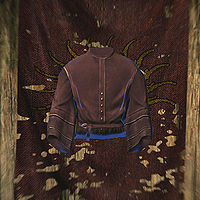 During a tour of the Mythic Dawn Museum, Silus Vesuius will stop at the display case with the robes in them and will passionately explain their purpose and creation: "Those robes were worn during the Mythic Dawn's secret meetings, where they plotted to bring the Daedra Mehrunes Dagon into Tamriel. Each bolt of yarn used to make the robe was colored with a dye made from sacrificial blood." This page was last modified on 19 February 2019, at 19:27.